Man Builds Mustang Out Of Lamborghini, World Goes "Huh?" So get this: Guy likes Lamborghinis. Guy likes Fords. Guy takes a 2007 Mustang and shoves a massive V-10 and transaxle into its middle. We can't look away. Building this monstrosity took one Mustang shell, one Mustang parts car, one Lamborghini Gallardo parts car, and several thousand hours of labor. Everything from the transmission to the all-wheel-drive system is claimed to work. And we'll be damned if we know what to do with it. What we have here depends entirely on how you view the universe. A few things are undeniable: The fabrication is impressive, the attention to detail staggering. It is like that time you saw that gorgeous, six-foot-tall blonde in line at the grocery, heard her surprisingly deep voice, and then noticed she had an Adam's apple. You want to look away, but you can't. And whether or not you like the end product, you cannot help but admire the effort that produced it. The crown jewel of our private collection: The Tractorri. The short version? 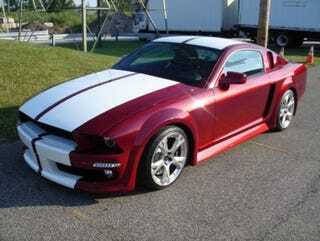 This is a body-in-white '07 Mustang shell with the mechanicals from a Lamborghini Gallardo underneath. From the ABS to the AWD to the E-gear transmission everything works. The long version adds two more Mustangs for parts, thousands of hours of labor and enough one-off parts to make most show cars blush. Oh, and our president drives it around—he put over 1500 miles on it this summer alone! Built and maintained by our own Rick Roush this is a werewolf in wolf's clothing! Check out the pictures for now and we'll have a full description of the build and show history up shortly! Admit it: Much like the Alfabeast, this is appealing. And you can't explain why. Neither can we. The V-6-Powered Alfa Romeo Bike: Wait, What?